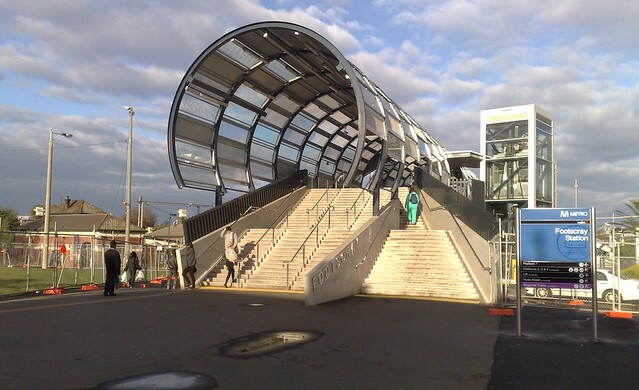 This is Footscray’s very impressive-looking new railway station bridge. It opened last year, part of a $61 million investment in urban renewal in the area. Unfortunately shortly after it was completed, the Regional Rail Link project determined that part of the bridge will need to be modified to cater for the extra platforms to be built. They’re claiming it will merely be “extended” — as if it’s some kind of extendable table. We suspect they’ll actually spend millions partly demolishing and rebuilding one side of the bridge. Given the Regional Rail Link project has been in the works almost as long as the bridge upgrade, was it too much to ask that the design for the bridge could have included space for the extra platforms? Passengers have also complained that the bridge provides minimal cover from the weather, and that the steps from the platforms are very steep.